Want to cuddle with Jon Lehrer? The research is clear: we live in bodies that need simple healthy touch and affection and societies which makes make that so hard to find. 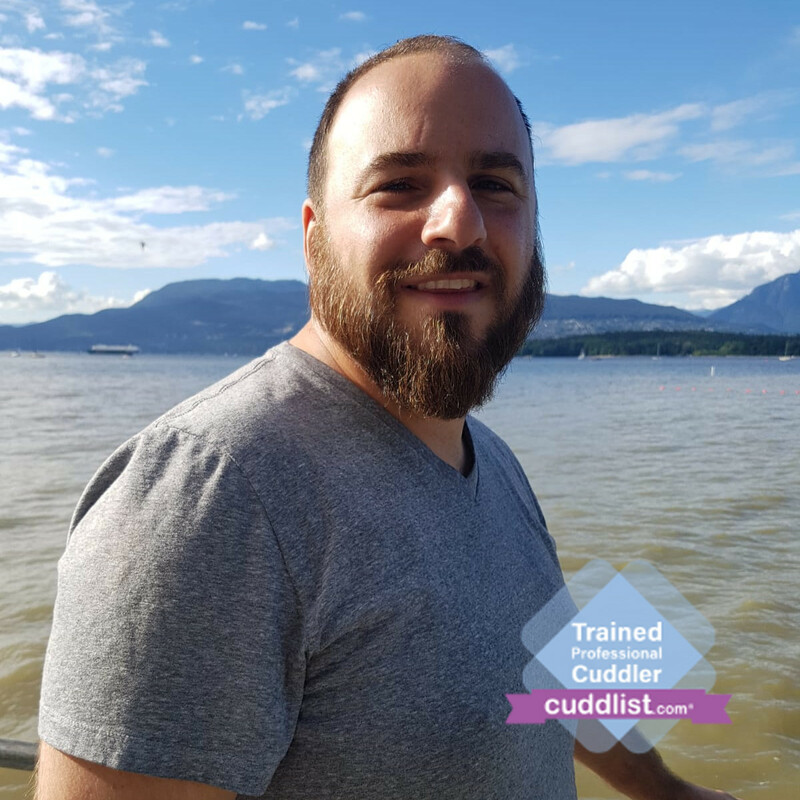 Cuddling is a natural and healthy remedy for all sorts of ailments, physical (immunity, heart health), mental (depression, anxiety), spiritual (loneliness, angst), and social (conflict, consent). 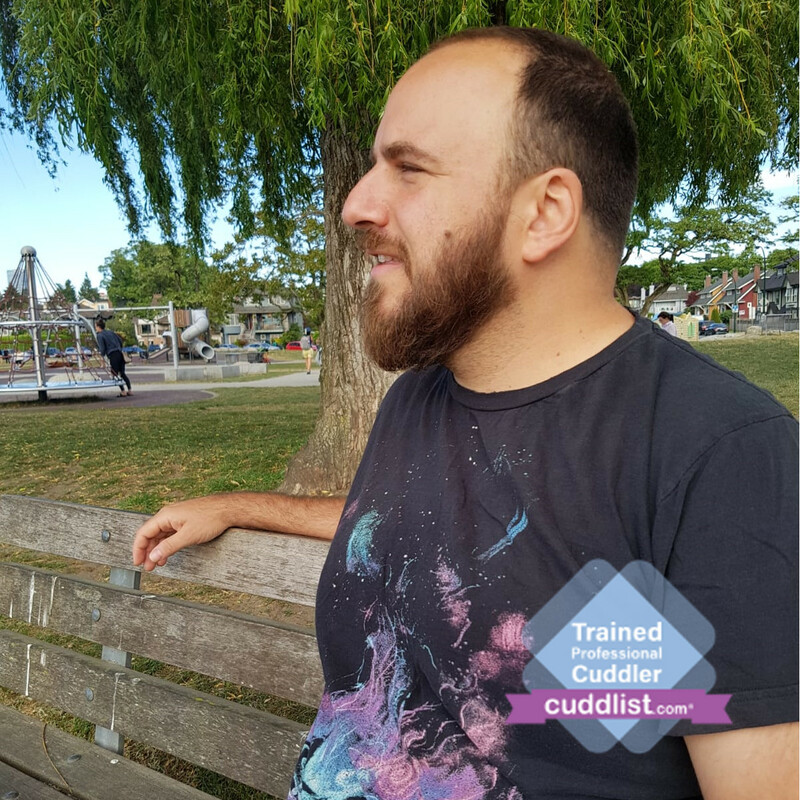 Cuddling with a trained cuddlist can help you transform your relationship to touch, reconnect to your inner voice, build assertiveness, and improve your relationships. Moreover, it can help you to feel seen, heard, held, and supported in a way that that transcends words. 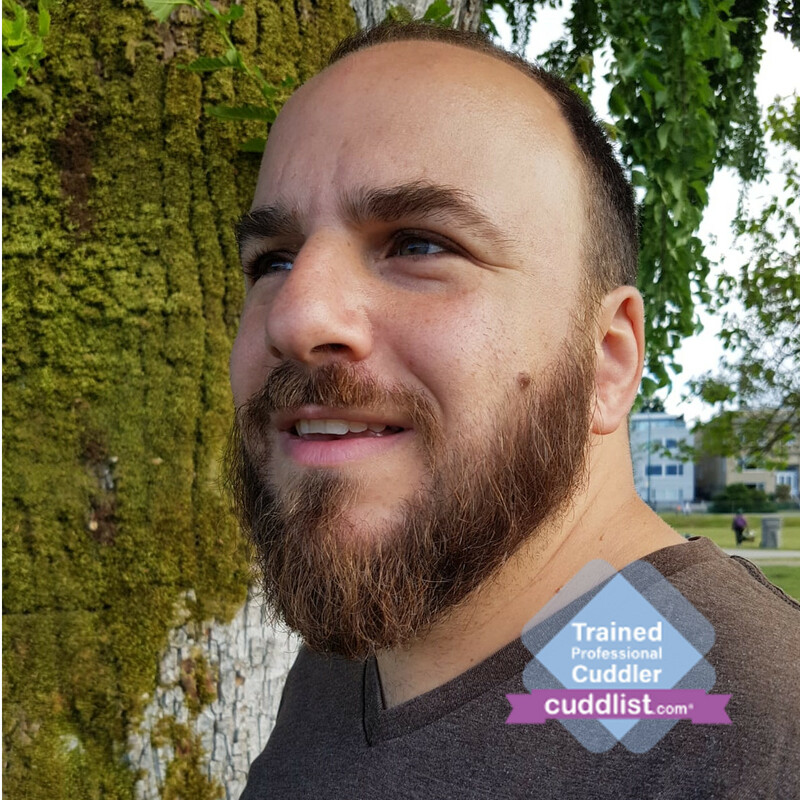 My name is Jon and I bring over a decade of experience in the cuddle movement. I have a warm grounded presence, a kind caring heart, a friendly sense of humour and a natural healing touch. My physical frame is broad and bearish and my hands are usually quite warm. In addition to my work as a cuddler, I am a cancer researcher and professional musician. I am also passionate about gender and embodiment work. Though I don’t get to do it often, I really like flying hanggliders! 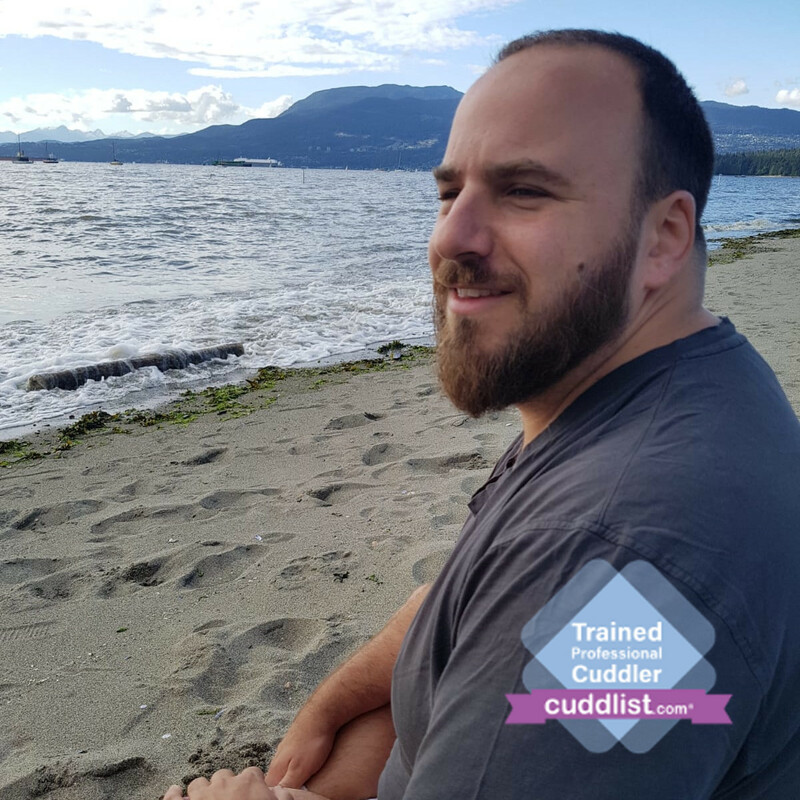 My practice focuses on the therapeutic and transformational benefits of cuddlist-facilitated, client-centered cuddling. Whether you’re wanting to satiate skin-hunger, find comfort and closeness, relax and destress, or completely redefine your experience of human touch, I can help. 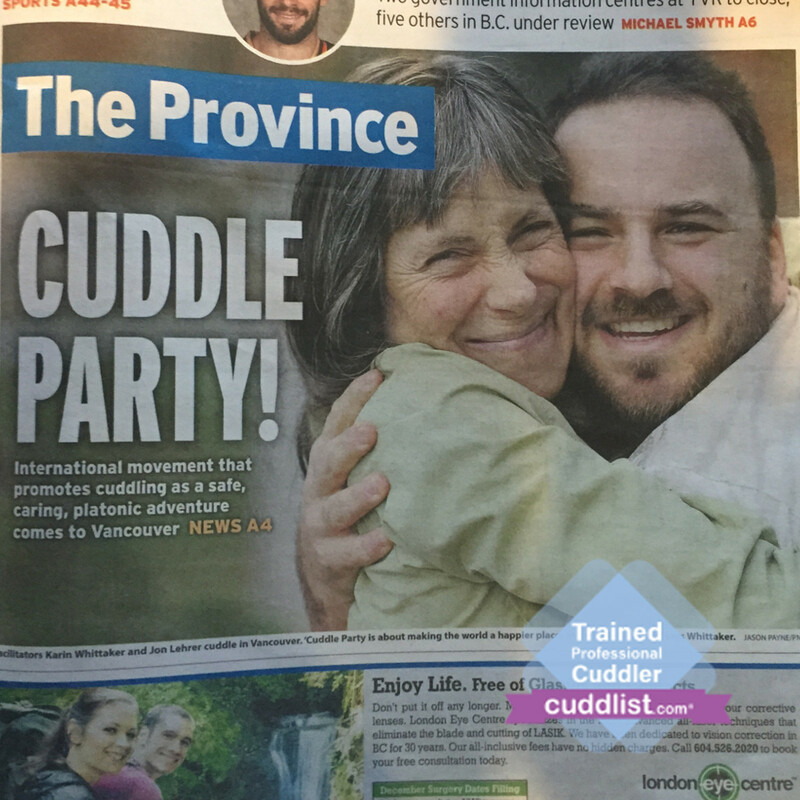 I see clients with a variety of ages, genders, abilities, and cuddle-comfort-levels. Together we will craft custom-made snuggle sessions that move at your pace, meet your needs, and feel great! So that’s me. I look forward to meeting you and to creating a safe, warm, non-judgemenetal and empowered space for us to connect. And whether we meet or not, I wish you all the best on your journey! Jon was even more deliciously cuddleable than I expected, and I had high expectations! -Shirley, structural alignment bodyworker. Once you reach out to me, I will schedule a brief phone call with you to learn more about your needs, answer questions, confirm our Code of Conduct, make sure we are a good fit, and discuss any logistics. Sessions may take place at my home or at a suitable location of your choosing. If at another location, there will be an outcall fee based on time and expense of travel. I will determine this fee based on your location and inform you prior to booking the first session. My home is located in Commercial Drive neighborhood, near 1st Ave, easily accessible by public transit. When you arrive, I will orient you to my home and cuddle space, offer you a glass of water, and ask if you have a music preference. You can wear comfy clothes or change when you get here. Please wear a minimum of t-shirt and shorts, and please arrive having bathed/showered within the last 10 hours. I promise to be just as prepared! During our first session, we will start by taking some time to connect and build the agreements that we both need to feel safe and comfortable, and to make sure that our time together is tailored to best meet your needs and interests. We can then transition into cuddling at your readiness. My home is 2 steps down from ground-level. I apologize for any accessibility issues this may cause. We will have a couch, floor, and queen sized bed available for our use. Free street parking is available and I usually find a spot within a block or two without difficulty. While I have no pets, there has previously been a cat in the space. For the purposes of safety, all sessions are filmed without sound and maintained securely for 2 weeks before deletion. You can receive your footage by request during the 2 weeks following your session (its pretty boring :)). I currently accept cash, cheque, and e-transfer only.